Charles Jackson “CJ” Hoople came to Bremen in 1876 and opened a saloon that would become the most venerable tavern in Indiana: Hoople’s. His father was John Rawden Hoople, who had come to America from French Canada in about 1830 and married Polly Couklia, in Richland, Ohio, in 1836. They moved to Michigan, where he bought 58 acres to farm. Daughters Augusta and Hattie married a Lakeville farmer and an Elkhart machinist. Son John Oscar Hoople took over the farm and raised a family of his own, eventually retiring to Lakeville. Youngest son CJ (also called “Charlie”) served in the 10th Michigan Cavalry, Company I, during the Civil War and mustered out in 1865 as a corporal. Middle sons Leander and Morris served in the 24th Michigan Infantry, Company H, and weren’t so lucky. 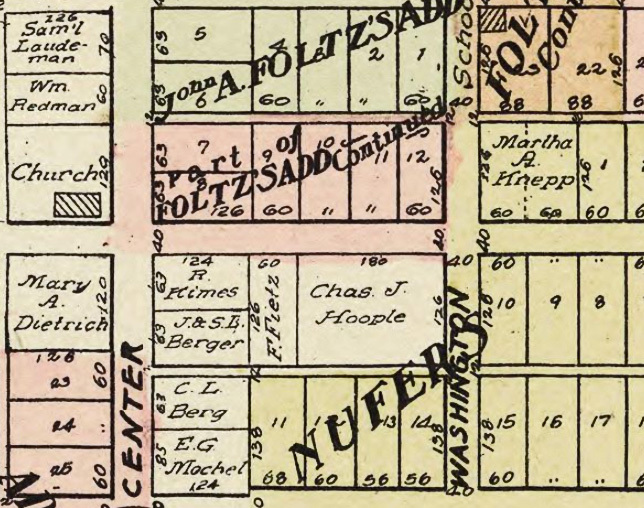 In 1879, CJ married German baker’s daughter Caroline Biehl in Marshall county and, in 1881, bought the storefront in Bremen that he would open as Hoople’s Tavern a year later. He did well and bought other property in town. In 1889, his safe was burgled of what can only have been his life savings: $500 in gold and $5000 in securities. Click on any of the images below for a larger version and page through the gallery. CJ and Caroline had at least 10 children, some of which died quite young, as was still common at the time. In 1907, when CJ was 61, his eldest son Oliver Otto Hoople took over the saloon. Oliver had married Kathryn Claxton in 1904 and had two daughters. In March of 1908, the “liquor remonstrance” in Bremen was said to be destined to put Oliver’s saloon out of business along with five others. Most switched to soft drinks and sandwiches until liquor was reinstated in 1911. Charles J Hoople died of a sudden illness in 1916 at 70 and Caroline in 1925 of heart failure at 69, followed in 1926 by Oliver’s wife at 40 of kidney disease. Oliver remarried to Florence Ditty, the daughter of the local justice of the peace. Oliver’s daughter Helen married an Elkhart druggist named Houseworth, and Lucile married and divorced twice, leaving her with one son and the name Mabbott. Oliver eventually turned Hoople’s over to Lucile and died in 1968 at the age of 87. Lucile ran the tavern until 1993 and died in 1996 at the age of 91. 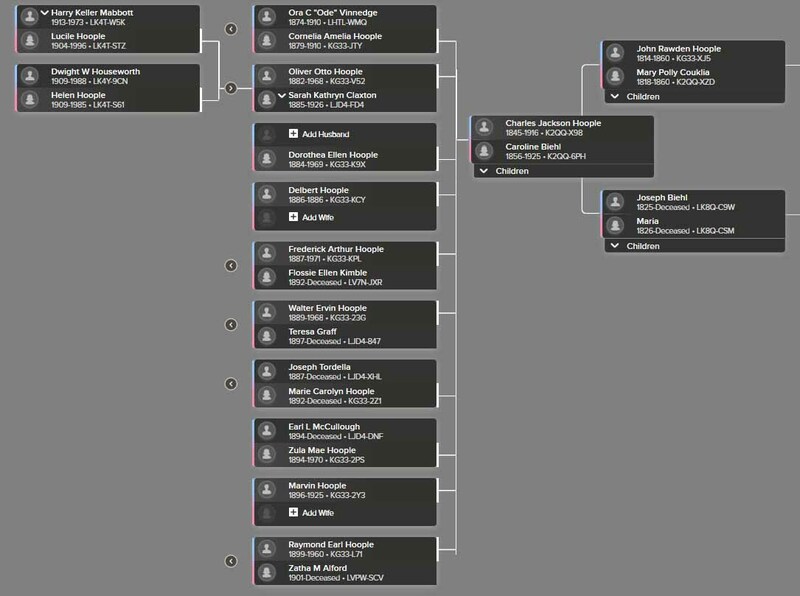 Click the image below for a larger version of the Hoople family tree.